We got caught up in Wind Waker birthday madness yesterday, but we didn’t forget that the 3DS is finally out in the wild in Europe. And apparently the launch events kicked off with style and gusto – and the chaos we’ve usually come to expect from midnight console launches. We’re looking forward to an inside impression from our very own Matt Friett, but if you need some 3DS news to tide you over, check below for a quote from Computer and Video Games on how the festivities proceeded. The platform holder held an official launch event at London’s Old Billingsgate in the lead-up to launch, where BRIT award winner Plan B, rock band Hadouken and girl group Parade performed alongside live comedy from Russell Kane. The evening then quickly focussed on launch events running along London’s Oxford Street, where Steet Fighter producer, Yoshinori Ono was in good spirits, mingling with the crowd and challenging those in the 400-strong queue to a bout of Super Street Fighter IV 3D (he mostly won). At the front of the official line was 22-year-old Marwan Elgamal – the same man who claimed the UK’s first Wii – who told CVG he’d been queuing for the best part of a day for the prize of being the UK’s first Nintendo 3DS customer. 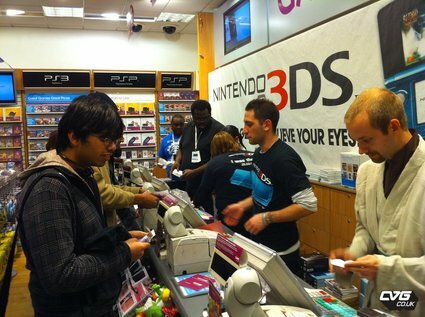 Hundreds of customers swarmed London’s shopping capital at GAME, HMV, Currys and more for a chance to get their hands on the device, and it’s unsurprising that Nintendo was quick to hail the UK launch a success.